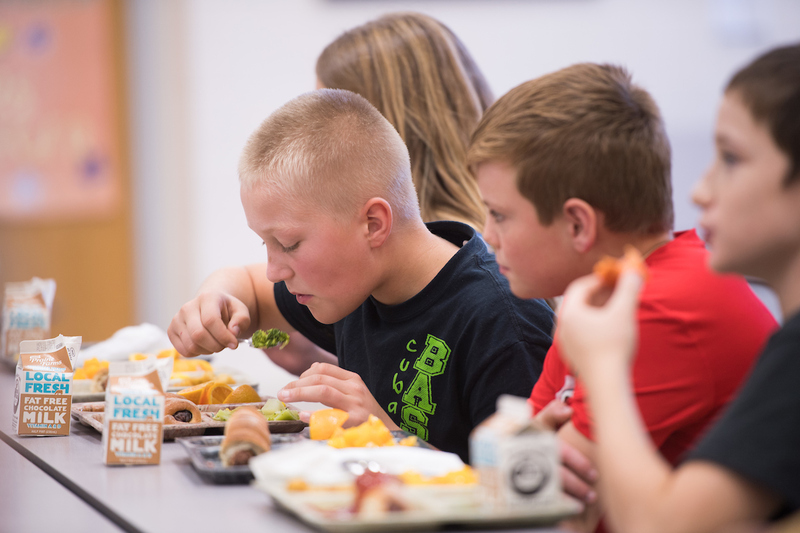 Landyn Haas, a sixth-grader at Maquoketa Valley Middle School in Delhi, Iowa, eats broccoli during a recent lunch period. Haas' school is one of several that is participating in a program that collaborates with the College of Public Health in an effort to help kids eat healthier meals at school. Photo by Tim Schoon. Erin Knipper talks about the upcoming weekend with a group of elementary school students during lunch at Maquoketa Valley Elementary School. Or what happened in their day, or about their favorite games. Along the way, she slips in a casual comment about how good the food on the students’ plates looks, then moves on to the next topic of discussion. Knipper is an eighth-grader at Maquoketa Valley Middle School in Delhi, Iowa, and a Cafeteria Captain, an older student who works with fourth-graders in the school to encourage them to eat healthier lunches and develop good eating habits while they’re young. The message that it’s cool to think about things like nutrition is better received when it comes from someone closer to the child’s age. “Students tend to listen to other students better than they do adults,” says Mary Ries, school nurse for the Maquoketa Valley Community School District who oversees the Healthy Schools-Healthy Students program. The U.S. Department of Agriculture (USDA) initiative works with Maquoketa Valley and other districts across the state to implement strategies that encourage students to eat more nutritious lunches more often. The program uses classroom education, training for food service staff, and modeling and counseling by other students to encourage healthy behaviors. Schools that put chocolate milk in the back of the milk cooler see an increase in consumption of healthier regular milk that’s stored in front. Students are more likely to take a piece of fresh fruit that’s displayed in a decorative basket or rack instead of in an institutional tub or bowl. Fresh fruit consumption doubled at some schools when it was offered in a decorative container. A well-lit, colorful cafeteria that seems more like a restaurant creates a more relaxed atmosphere, and students make better choices when not under stress to finish eating before the lunch period ends. The program in Iowa is administered by the Iowa Department of Education and evaluated by the University of Iowa College of Public Health. Its goal is to use strategies proven by research to reduce childhood obesity, provide fresh fruits and vegetables to students who may not have regular access to them, and establish good eating habits for life. While the USDA program is national, Askelson says the UI focuses on rural school districts that have unique challenges due to their often remote locations. For instance, urban and suburban districts may employ or have access to registered dietitians who can work with school menu planners, and chefs who can develop meals that respond to students’ high expectations. Rural school districts rarely have access to those professional resources, Askelson says. More importantly, Askelson says rural school districts may not receive daily deliveries of fresh fruits and vegetables because of their location. In some districts, vendors deliver food only once a week, if that. And while all school district food service operations work on tight budgets, the challenges are particularly acute in rural districts. Preparing fresh fruits and vegetables can be time-consuming—for example, someone has to cut, peel, and prepare it, which requires personnel who have to be paid. It’s easier and more cost-effective to open large cans of green beans and warm them on the stove, Askelson says. But students aren’t as likely to eat canned beans as they are fresh beans. This is especially troublesome in rural districts where a higher percentage of students are obese and consume fewer fresh fruits and vegetables. A district faces an even greater budget strain if it purchases fresh food that students are more likely to throw in the trash. “Interventions that work in urban areas don’t always work in rural areas,” Askelson says. The program has two components: one in the lunchroom and one in fourth-grade classrooms using a nutrition education curriculum called Serving Up My Plate. The curriculum introduces the importance of eating from all five food groups every day through a variety of hands-on, interactive activities. In the lunchroom, students are encouraged to make healthier choices. That can mean improving the quality of the food, designing the cafeteria so it’s a more inviting place to eat, or making nutritious food more readily available. Askeslon says the UI College of Public Health students work with school kitchen managers on the cafeteria itself. The way that food is arranged, for instance, can determine what kind of food students are more apt to grab. The Clear Creek Amana School District, which has schools in Tiffin, Amana, and North Liberty, found that putting chocolate milk in the back of the cooler increases consumption of healthier white milk that’s easier to reach. Putting cookies on a lower, less accessible shelf reduces consumption because students have to bend down, which is just enough extra effort to act as a deterrent. Michele McCoy, nutrition director in the Lisbon Community School District that is part of the UI project as well as the Springville Community School District, says she rearranged the food serving line in Lisbon High School to put the more nutritious food first and the less healthy food at the end. Tyler Hoeger, a fifth-grader at Maquoketa Valley Middle School, eats broccoli at lunchtime. The UI College of Public Health works with rural school districts across Iowa to encourage more students to make healthier food choices. Photo by Tim Schoon. She also places whole fruits and vegetables in decorative straw baskets she purchased at a hobby store, which has increased consumption because she says students find them more inviting than chrome bowls. Debbie Klein, nutrition director in the Clear Creek Amana district, saw similar results in the middle school when she put fruit in a tiered-cart instead of a plastic gray tub. “Not only did it show a great display, it increased the fruit consumption and offered more choices,” she says. Askelson says research also shows that improving lighting or adding color to a cafeteria makes it a more inviting, less stressful environment that can lead to better choices. McCoy says Lisbon installed booths and high-top tables in the middle school cafeteria, which appealed to students. “It made it feel more like a restaurant,” she says. Food service administrators also talk with students to determine what kinds of changes they would like to see. Klein started a conversation series with food service staff and students that generated useful suggestions. That led to expanded offerings that now include a canned fruit, a fresh fruit, and a dried fruit. Klein says the Clear Creek Amana schools learned that students were stressed by long lines, which meant many had to eat quickly before the lunch period ended. She fixed this easily with a signboard at the entrance to the lunchroom advertising the day’s menu. “Now they can see the menu earlier and can decide what they want by the time they get to the front of the line,” she says. The line now moves more quickly, giving students more time to eat their lunch before the bell rings. Students also participate in taste tests, which encourages them to try new foods and helps school officials determine if enough students like it before adding it to the menu. That gives the students a say in what they’re eating, and allows the district to save money by avoiding foods that students won’t eat. Conversations have led schools to offer new and different types of food and beverages, like tangelos, pomegranates, avocados, jicamas, and infused drinks; and flavor stations that offer different seasonings, such as paprika, garlic salt, or lemons and limes. Some schools relabeled food to give it a catchier name, like changing green beans to power beans and broccoli to brainy broccoli, or naming food after the school mascot or a local landmark. At one district, the cafeteria director offered hummus as a condiment, but the students showed no interest. As part of the evaluation, Askelson’s student researchers gather data and interview students, faculty, and staff to determine if the program made a difference. Results so far show it has been a success. McCoy already has seen fruit and vegetable consumption increase in Lisbon and more than double in Springville, while UI researchers reported fourth-grade students are more willing to try new foods, eat more of their lunches or certain healthy items, and talk to their parents about eating healthier snacks. The cafeteria coach program that Maquoketa Valley’s Erin Knipper participates in also has been a success. “Cafeteria coaches enjoyed interacting with the younger students and the relationships they developed with them,” Askelson says. The coaches—or captains, as they’re called in Maquoketa Valley—work with elementary school students as role models and teachers themselves. They encourage the fourth-graders to try new foods and model healthy behaviors, as well as build friendly relationships. The students sitting with Knipper earlier this fall obviously had learned well from her—their plates were filled with fresh corn and broccoli, sweet potatoes, and canned peaches. Knipper says she can be a role model because she’s changed her own diet as a result of what she’s learned. She eats less junk food in favor of healthier snacks, and drinks more flavor-infused water. Soda and energy drinks—once a staple of her diet—have disappeared entirely.